Bite-Sized: Cathedral | Wake up, Meeples! 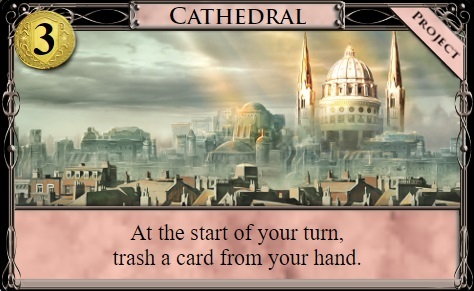 Cathedral is extremely powerful. Almost always a turn 1 buy, it will almost always take care of your thinning needs all by itself, allowing you to continue building your deck by adding payload almost immediately. The key thing to note is that you buy this one time, and you start reaping rewards the very next turn (and every turn after). The trashing is mandatory, which might make it look like there’s a significant drawback, particularly in the face of discard attacks, and/or if there is no decent source of extra gains to stick more things in your deck. This is somewhat true, but such situations are rare, and the increased speed you get from being able to build and see good cards from the fast thinning is almost always enough to overcome these drawbacks.